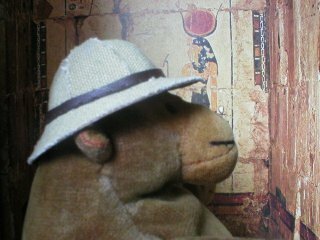 "People ought to be more careful where they leave things, you know"
Whenever Mr Monkey is in foriegn parts, discovering the source of a misplaced river, or collecting souvenirs from some dusty old tomb, he dons his trusty solar topee for protection from the burning sun. 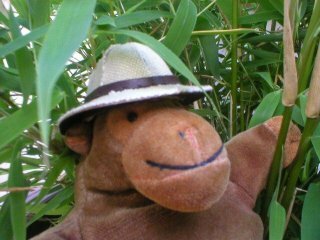 Mr Monkey's solar topee is constructed from fabric from a rucksack which fell to bits, held up by strips of light card. The band is from one of the straps from the rucksack.